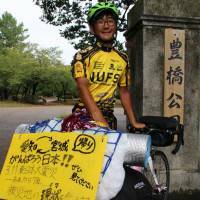 Kenshi Yamamoto, a 20-year-old university student from Toyohashi, Aichi Prefecture, made a 1,746 kilometer round-trip bicycle journey earlier this month to Kesennuma, Miyagi Prefecture, to challenge post-disaster media coverage that he believes focuses excessively on depressing news. Yamamoto visited the Tohoku region three times while in high school as a volunteer in the wake of the 2011 Great East Japan Earthquake disaster, in which Kesennuma was hit hard by tsunami. A second-year student at Nagoya University of Foreign Studies, he returned on Aug. 15 — sporting a new suntan — to Toyohashi Park in the city of Toyohashi, which had been his point of departure on Aug. 1, with a notebook filled with messages of hope from disaster victims. As a volunteer he had seen the disaster-hit areas gradually being restored, but was concerned that media reports on the areas mostly focused on discouraging stories. 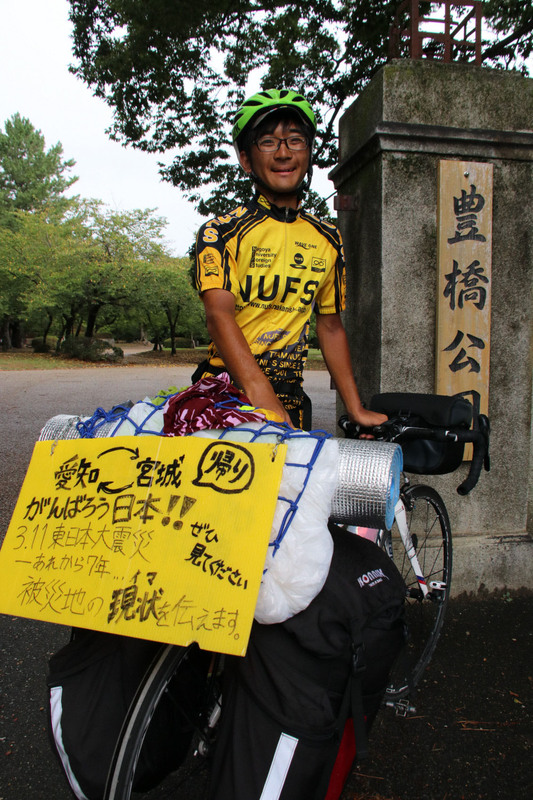 “If people knew how their support has led to good results, all of them would think they did the right thing,” Yamamoto said, adding that he decided to go on the bike trip because of his experience cycling last year to Kumamoto Prefecture, which was hit by strong earthquakes in 2016. The trip in Tohoku was no easy ride. Salt stains appeared on his skin as he traveled under the scorching sun. When passing through Fukushima Prefecture, he found that he could not access some roads near the Fukushima No. 1 nuclear plant, which suffered fuel meltdowns following the quake-triggered tsunami. But he rode on, handing his notebook to those he met along the way and asking them to write down what they had newly achieved following the disaster. Collecting messages one by one, he reached Kesennuma on Aug. 7. A man whose house was swept away by tsunami thanked Yamamoto for giving him the chance to express his gratitude, saying he didn’t know how to thank all the volunteers from all over the world who had helped him. As Yamamoto was leaving, disaster victims told him they were counting on him. Although he initially set out to collect messages to bring back to his own supporters, Yamamoto realized he was now tasked with giving the victims a wider voice. “I felt I had twice as much responsibility and that I should complete my task,” he said. During his journey, Yamamoto showed the messages to people with whom he struck up conversations during breaks or even while waiting for traffic lights to turn green. Some were surprised to hear about recent developments in the disaster-hit regions, such as the fact that a beach in Soma, Fukushima Prefecture, opened to the public last month for the first time since the 2011 events. Yamamoto said he plans to convey the victims’ messages, along with what he saw and heard during the journey, via social media and lectures. This section features topics and issues from the Chubu region covered by the Chunichi Shimbun. The original article was published on Aug. 16.